Back Where He Should Be. It is often said that nothing is handed to you on a plate and that if you want something, you have to work for it; and rarely is this more apt than in the arena of motor racing, where all too often we see great potential snubbed out in its earliest stages through lack of opportunity (for which, read “suitable financial backing”). 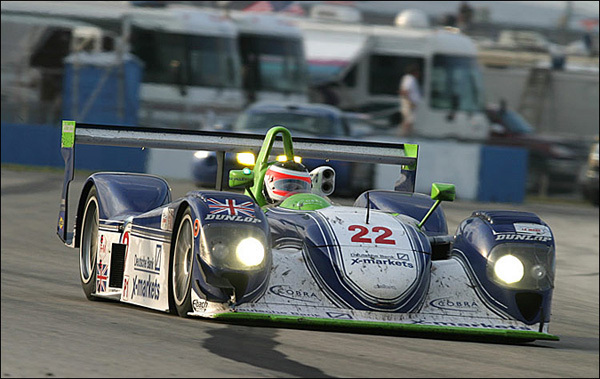 Having enjoyed a busy racing career in sportscars, beginning in British GT with Rollcentre in 2000 and progressing through the factory TVR squad to LMP1 in the LMES, ALMS and at Le Mans, Rob Barff found himself entering the second half of the opening decade of the 21st Century with increasingly few opportunities to race; and it wasn’t long before it appeared as though his career as a professional racing driver was, to all intents and purposes, at an end. How then, do we arrive at the present situation which sees the Salisbury-born 38 year old entering 2013 with three highly competitive racing programmes already signed and sealed? Between the years 2006 and 2010, Barff’s race outings were few and far between, but they included the Spa and Dubai 24 hour races and a couple of GT4 European Cup races with RJN. The introduction of the Bute Motorsport GT Trophy in the UK in 2011, however, saw him teaming up with FF Corse client Leon Price in a Ferrari 458 GT3 and the pair enjoyed a clean sweep of the four races in the series. Barff was (and is) a senior instructor with FF Corse, having been with Anthony Cheshire’s company since its founding, and the success in GT Trophy led quickly to a race programme in the UAE GT Championship for Price and Barff in the 458. “We raced last year under the banner of AUH motorsport – a local Radical team, but the GT side of the business was led by Ian Bickerton, and that has since evolved into Dragon Racing. Leon owns the team and Bicks has assembled a great bunch of guys to run the car out there. “As well as the 24, we’ll again be doing some UAE GT races; more to make sure that Leon stays sharp over the winter.” Indeed, since we spoke, Price (driving solo) enjoyed two wins out of two at the recent Dubai Autodrome Motorsport Festival. 2012 also saw Barff and Price racing in the Blancpain Endurance Series in a Von Ryan Racing McLaren MP4-12C GT3. “It wasn’t the easiest start for us, or for any of the McLaren runners – and of course there were all the usual trials and tribulations that come with a first year of a new project – but over the course of the season the car improved consistently and 2013 should be a lot easier for all of us; but having said that, the BES is going to be hugely competitive again and any success is going to take a lot of hard work. The third racing programme sees Barff teaming up with another of his FF Corse clients, Gary Eastwood, in a Ferrari 458 GT3 in the British GT Championship, and Barff can’t wait to get back to the series he last raced in back in 2006; “It’s going to be brilliant to be back racing in the UK next year,” he enthused. “I raced a Formula Ford 1600 in the Champion of Oulton series back in 1993, so it’s great that my return to the BGT will take place on the same circuit 20 years later!”. “I’ve known Gary for ten years or so, from when he first got his racing licence at the Silverstone Racing School. He then went and raced in Formula Palmer Audi and in Porsche Cup before I suggested that he had a test in an FF Corse Ferrari in 2009. That went well and he’s been with Anthony ever since”. “Gary’s out at Michelotto now and is keen to get his hands on his new car. I think he’s going to do well next year; he’s a true sportsman racer and keeps his hobby and business life separate – he’s a metal recycler by trade – but I think he’ll be among the faster ‘gentleman’ drivers from the start. So with all this racing in 2013, will he still have time to be involved in the Nissan Playstation GT Academy as well?